The two new e-liquid flavors from V2 are Chocolate and Cherry. Yum! These new V2 e-liquid flavors, like all of the Platinum E-liquid flavors from V2 Cigs, come in a convenient and nicely-packaged bottle. The e-liquid bottle size is 25 ml. Each bottle of V2 Platinum E-liquid is childproof, and comes with an easy-to-use dropper. The dropper is built right into the lid, which makes refilling your e-cigarette cartridges (and/or filling blank carts) a total breeze! 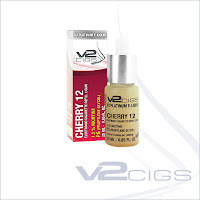 All V2 Platinum E-liquid is available in several different nicotine strengths. They are: Full (18), Medium (12), Light (6) and Zero (0). This gives you several options when choosing your preferred vaping nicotine level, which allows you to personally customize your vaping experience. For example, if you tend to like full-flavored cigarettes, then you should probably go with the Full (18) option. However, if you prefer "Light" cigarettes, then the Light (6) is most likely right up your alley. On the other hand, if you don't want any nicotine at all (many vapers have weaned themselves down to zero nicotine! ), then Zero (0) is what you're looking for. Save Money By Using E-liquid! You can use the V2 Platinum E-liquid to refill your flavor cartridges, or to fill blank cartridges (like the new V2 Cigs LiquiMax Blank Cartridges). Either way, it'll save you money. But did you know that it's also better for the environment? Well, it is! Using e-liquid for refilling/filling is much better for the environment because it reduces a lot of waste. For example, instead of just throwing away your empty flavor cartridges, you simply refill them, so you can use them again and again! Bottom line, you can save money and help reduce waste all at the same time. And that's damn cool. Save Even More Money With A V2 Coupon Code! Use this coupon code to get save 10% on anything you buy at V2 Cigs.com. This includes V2 starter kits, batteries, carry cases, accessories and even their Limited Editions! For more information on the latest V2 Cigs coupon codes, go here.